Lush, labor-intensive Levantine cuisine has a long history. The spice rubs and marinades are closely guarded secrets. 1101 San Pablo Ave., Albany. Cash, Discover, American Express, and Visa. Hours: Tue.-Thu. 11 a.m.-9p.m. ; Fri. 11 a.m.-10 p.m.; Mon. 5-9 p.m.; Sat. 8 a.m.-10 p.m.; Sun. 8 a.m.-3 p.m.
Against the stark white of a heavy oval plate, the garlic-studded fava beans glistening with olive oil are marble-big and a bold, teasing brown. Three shades away from red, this is a brown with tales to tell, the hue of riverbeds and burnished skin and sun-baked ancient sacred sites. Sprinkled over the beans like deep red dust is tangy-salty sumac. Popular in the Levant — that eastern-Mediterranean sweep that includes Syria, Lebanon, Israel, and the Palestinian Territories — the salad known as mudamas is vegan, but primordially so. This is not the well-meaning, watered-down manipulation of a former meat dish. Mudamas was vegan to begin with. Like most Levantine food, it began ages ago. Like many other items served at Zaki Kabob House — tabouleh, mashweeya, moujadara, and more — mudamas was already vegan when Washington crossed the Delaware. 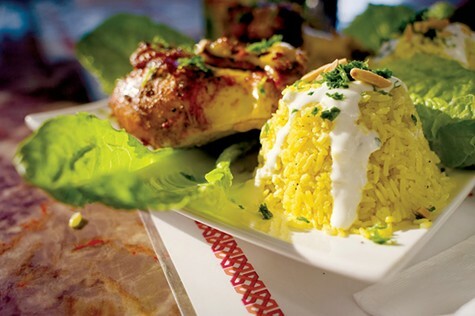 Meat dishes — shawermas, kebabs, the house-special rotisserie chicken — are on Zaki's menu, too. Plated plainly in a homey, wooden-table setting whose glass west-facing wall reveals brash San Pablo Avenue, even the humblest item here looks and tastes like a lush, labor-intensive amalgam of precious rare exotica. Saffron rice dazzles. The hand-rubbed, house-marinated chicken is smoky, tart, and teetering on the right side of dry. For all its peasant-pleasing, sunshiny simplicity, shakshuka — two poached eggs swimming in herb-strewn stewed tomatoes — wears the dignity of a dish relished for centuries. Topped with a peridot olive-oil pool, served with a basket of Ritz Cracker-thin but warm and plentiful pita bread, Zaki's baba ganoush is lemony and I-do-not-deserve-this creamy. Even the coffee, a cup of which comes free with every lunch entrée, is casually luxuriant. Refreshing mint tea is free as well. Does Middle Eastern food always feel rich and rare because the Levant borders on the Fertile Crescent? Is it because we know how much work and time it takes to make olive oil, yogurt, marinated meat and vegetables, shelled nuts, ground seeds, ground spices, dried fruit, filo dough? Is it because three major faiths claim Middle Eastern origins? Commerce has a lot to do with it. Many foods long prized in the west as pricey, protein-rich, silky-smooth rarities — sesame, olives, pistachios, chickpeas — are Levantine natives. The region was a longtime shipping and trading hub for other delicacies from far away: African coffee, Chinese citrus, Indian sugar and spices. These might be workaday staples in the Middle East, but in the West they still wield the glamour of old. After operating delis in Berkeley and San Francisco for over thirty years, Ramzy Ayyad's family decided to open its first restaurant two years ago. "Even though this location has been the site of so many failed restaurants that it was considered 'cursed' by Albany locals," he said, "we rolled up our sleeves and worked hard at making it look presentable." Jaunty souvenir plates from Jerusalem and Hebron dot the walls, along with framed miniatures, dried flowers, dangling ornaments, artificial fruit, pictures of peasants and camels and Martin Luther King, and a scarf depicting the Dome of the Rock. The ladies' room sports a huge, vivid, curiously captivating landscape painting, all red blossoms and green grass. During a weekday lunchtime, soft Arabic pop music plays and the restaurant is packed, leaving the lone server a little frazzled, but not too much to politely pour tea. House-marinated salads start with an effervescent tomato-cucumber-parsley palette. Mashweeya includes eggplant, grilled to a velvety consistency made more velvety still with olive oil. (For those who crave even more, bottles of Palestinian-made organic, fair-trade, cold-pressed Hurriya-brand olive oil adorn every table.) Among Zaki's soups is a thick vegan lentil-leek, satisfying with chewy pita, but slightly too salty in a way you notice only later. Served on puffy sesame-seed buns with lettuce, onion, tomatoes, and hummus, massive falafel burgers sport harmonica-sized fries on the side. The menu incorporates family recipes "which have been handed down over the generations and protected orally, because many in past generations were illiterate," said Ayyad, whose mother grew up in Jericho. Her rubs and marinades for the rotisserie chicken and kebabs are closely guarded secrets, but the spice mixture that infuses Zaki's chicken, beef, and lamb shawermas — served on plates, in wraps, and in omelets — features cinnamon, cumin, and anise, all imported from Syria "because we want to keep the taste as authentic as possible." His maternal grandfather was Moroccan, "which brings a little North African influence to some of our dishes" — such as the shakshuka, which is prepared here Moroccan-style, with fresh tomatoes. Another house specialty is Jordan's national dish, mensaf: rice-topped flatbread served with a lamb-yogurt stew. Lebanese mujadara is a cumin-perfumed magic mountain of spiced rice, slivered almonds, and poached green lentils. Topped with sweet caramelized onion rings, it typifies the kind of protein-rich, flavorful meatless meal that hippies tried for years and usually failed to emulate. Two starters are high points: Spheeha are palm-size pizzas topped with almond wedges, hummus drizzles, and cinnamon-spiked ground lamb. Their chewy dough evokes Navajo fry bread. Kibbeh — lamb/olive/onion-stuffed bulgur croquettes — look like taut little torpedoes, served in a star formation, augmented with lemon chunks. Squirt lemon juice onto this classic food (you'll never want French fries again) to understand the Levantines' love of extremes. What could be sourer than lemons, hotter than harissa, sweeter than baklava? Who else would know how to serve them side by side? After a meal here, other food seems to be simply missing something.